Shane Baguio (Fifth Year), Joanne Lai (TY) and Marcelina Krzywdzinska (TY) are taking part in the BT Young Scientist competition in the Senior Biology category. Here they tell us about their project – and what it inspired it. WHEN A TEACHER of ours returned from having visited Malawi in 2018, we got to see photos, video clips and stories about the trip – his visit to schools, the people, industry and tales about farming practices and how the people with so little (by our standards) had such a positive attitude to life and were extremely happy and enterprising. We saw pictures of how a population with little natural resources have made huge advances despite the difficulties they face. One of the things that resonated with us the most was the havoc being ravaged on the farmers and their crops by the Fall armyworm (FAW). How could such a small insect have such an impact on the farm incomes? We were especially taken aback by images of children removing the FAW by hand from infected plants. A little research confirmed the effect the moth and its larvae were having on the staple crops of Malawi and other African countries. The fact that it has no natural predator in these counties, coupled with the expense of pesticides, led us to investigate the possibility of a non-chemical, low-technology solution to the FAW using materials available to African farmers. We also wanted to examine the (even better) possibility of collecting the moths and larvae so they could be used as a free source of feed for chickens. This project and our knowledge of African farming has been aided by students we have connected with from Malawi and Kenya and their teachers. Based on infestation rates, which vary across the country, infestation has surpassed 80% in some hotspots. The Government of Malawi has prioritised pesticide distribution as an immediate response. This is unlikely to be a solution as most smallholders have never used chemical pest control and will not be able to afford them. According to the latest Integrated Household Survey (IHS4), only 2.3% of all plots had either herbicides/ pesticides applied in the 2015/16 agricultural seasons. Damage from FAW in Malawi has been significant, roughly 10% of this year’s dry season maize is expected to be lost to FAW, double last year’s damage. Currently, farmers and their families have resorted to picking the worm directly off the plants. Proposals to grow FAW resistant strains of crops is a longer-term solution. Intercropping offers some potential but is still years away and requires additional knowledge and seeds. We have designed two devices that Malawian farmers can place at the base of their crops. The first is designed around a “no technology” premise so is made from a 500ml plastic bottle, which is inverted and featuring specially cut-out sections. Placing mature leaves in the base will attract adult moths to lay their larvae inside the bottle. We have painted the cut-out panels of the device in order to increase the internal temperature in an effort to further attract the moths. We have cut serrated edges into the external features of the bottle which will ensure the FAW will injure itself if it attempts to crawl out. Farmers will be able to collect the larvae and feed them to their chickens or place them in a bucket of water before reusing the device. The second is based on “low technology” – this device is made from two 1.5 litre bottles, with the base removed from the first one and inverted. We used the second bottle as a funnel and placed it inside the first after cutting it down. We placed a miniature rechargeable light into the cork and painted the outside bottle a dark colour. This is our version of a Robinson’s Moth Catcher (which attract between 50 – 500 moths per night) using available waste material with the exception of a light unit that we have estimated will cost 5c or 42 Malawian Kwachas. All over Africa, countries are battling Fall armyworm. These crop-eating larval caterpillars are ravaging food supplies and posing major geopolitical challenges on the continent. Because the worms feed on over 80 plant species and develop into moths that can fly long distances, combating them requires coordinated, multi-pronged efforts. 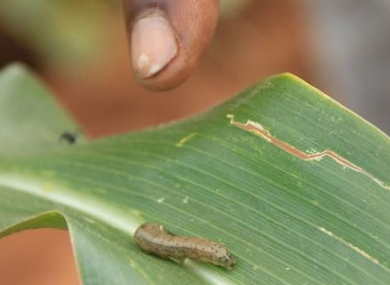 Since 2016, fall armyworms have invaded over 20 African countries including Kenya, Ghana, and Ethiopia; damaged over 1.5 million hectares of land; and destroyed staple crops like corn, sorghum, and pasture grasses. As a result, many countries are expected to suffer from food insecurity both this year and next. Some farmers have attempted to use chemical pesticides to fight the worms, but they have proven ineffective. Unless the insects are systematically stopped, problems will only intensify. As countries rush to implement preventative measures and solutions, it is important to keep farmers in mind. Our parents are from the Philippines, China and Poland so they know what it is like to be afraid of poverty and starvation. We really want to help because of that. The project is one of seven being undertaken by Desmond College, Newcastle West, Limerick. Their teacher is Mr Donal Enright. Email “The young Irish scientists trying to help contain the Fall armyworm”. Feedback on “The young Irish scientists trying to help contain the Fall armyworm”.